Take this link for a short introductory video explaining the shortcomings of Modern Art Criticism taking the example of a FAKE drawing hailed by experts as a Rembrandt masterpiece. In Note 2 (of the Synopsis) Prof. Van de Wetering says basically - we have no time for the earlier interpreters of Rembrandt because we have built a whole edifice around style, we do not want to get involved in the humanity of the man, we are scientific" we deal with style. The scholars are concerned to find a rational development in Rembrandt's style. To achieve this they have deattributed works that do not fit with their conceptions but in the mirror section I demonstrate that their conceptions are mistaken. Drawings that they have dated nearly 20 years apart were in all probability done within days of one another. The difference in style was due to the difference in stimulus: observing in a poor quality reflective surface, or observing direct from life. There is a radical change of style in Rembrandt's paintings that develops more or less chronologically. It was reasonable to suppose that there might be a parallel development in his drawings but the discovery of Rembrandt's use of mirrors shows that the development of his drawing style is not as simple as the scholars imagine. Take link David anoints Solomon for commentary on this example. 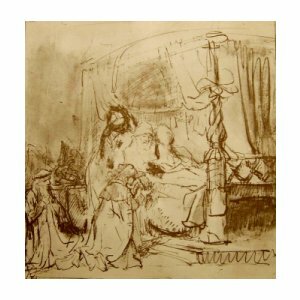 In this drawing of David appointing Solomon as his successor we are looking at a great drawing that has not been accepted as a Rembrandt since 1922; yet its provenance is near perfect. It has been in the collection of the Dukes of Devonshire for 300 years. One can see that Bathsheba's head has caused problems. One can also see that Solomon's acolyte is less than satisfactory, the rest is pure brilliant Rembrandt. As an illustration of the event as told in the Bible it is incomparable. We see the gratitude and love of Solomon ï¿½ the slight unwillingness and the weakness of old age in David ï¿½ and, though the head is a blot, - we can feel the pressure that Bathsheba has put upon David to appoint her son as successor, (he was not first in line of succession). I would say it is one of the greatest drawings ever made. When I examine the peripheral material I am utterly convinced that it is the work of Rembrandt. The bed-post is great and typical ï¿½ the drapery above conveys the feeling of diaphanous material ï¿½ by contrast the robe of Solomon tells us with a few lines that it is made of a heavy velvet ï¿½ we can read the pose of the figure beneath perfectly. It conveys gratitude and reverence for his father. The experts see the blot that is Bathsheba's head but not the sublime quality of the drawing as illustration. As a fellow artist I find it reassuring that Rembrandt, even when on top form, was not able to achieve the head of Bathsheba or the acolyte with the panache we see in David. The Solomon was perfected after a struggle. It would be wise to learn to judge this and similar drawings by their successes and be as tolerant of the lapses as Rembrandt was himself. He was not a perfectionist. It is one of the secrets of his creativity.